Leopard Print Swing Dress is rated 4.6 out of 5 by 10. 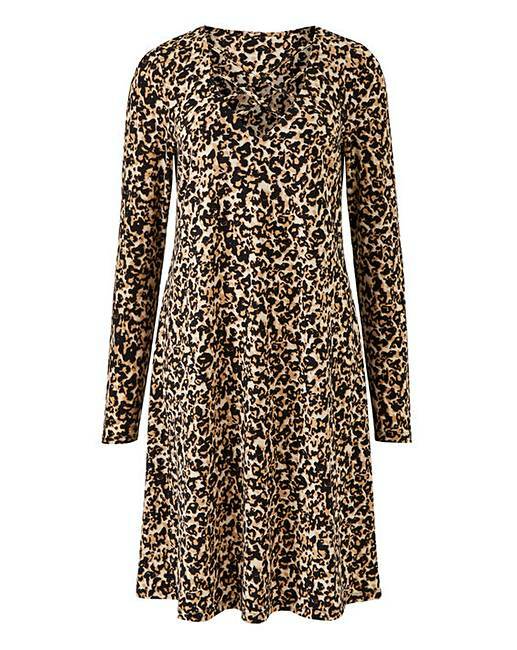 This easy-to-wear animal print swing dress is the must-have of the season. Made from a soft jersey fabric, the dress features cross strap detail at the neckline, to create a more feminine look. Wear all day long with your casual knee-high boots or team with tights and a statement boot. Rated 4 out of 5 by 12345 from Love this Fits really well, maybe slightly shorter than I would ideally have wanted but otherwise lovely especially the neckline. Rated 5 out of 5 by Sonny from Lovely dress I brought this dress a couple of weeks ago and the fit is great. At my age I like to wear dresses like this over trousers and it looks great.